Winter is an amazing season to watch wildlife. Rain or shine, the weather should not stop you and your kids from enjoying the abundant wildlife in the Bay Area as they embrace the wet season. Fortunately for us, we live in a prime spot for discovering amazing mammals, insects, birds, reptiles and more who also call the Bay Area home. Banana Slug will not be hard to stumble across. Marvel at these remarkable mollusks on your hike as they thrive in a moist environment. Marine animals such as the giant green sea anemones, purple sea urchins, red abalone, purple and ochre sea stars and more decorate the tide pools. One of the best places to tidepool is the Fitzgerald Marine Reserve in Moss Beach. December 12th explore the exposed rocks during the king tides. The low tide will reach its lowest at 3:16pm so the best tidepooling will start at 2pm. On December 13th, the low tide will be at 4:03pm. Elephant Seals breeding season starts at Año Nuevo State Reserve. 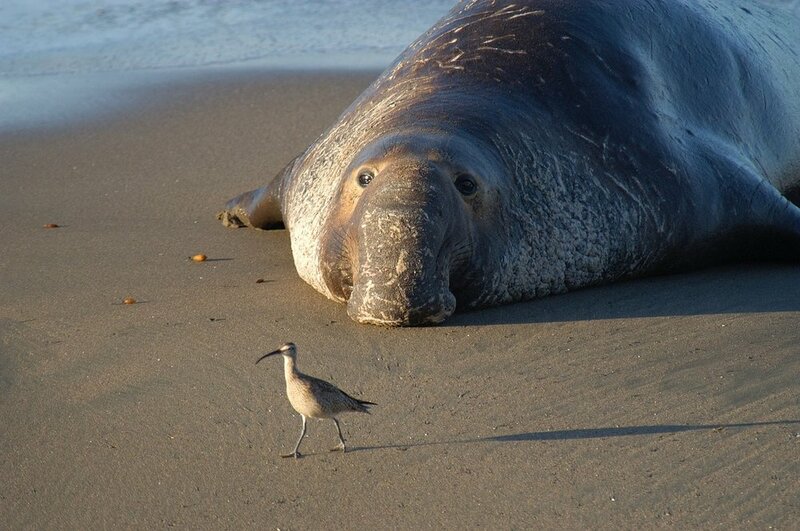 Register for the Elephant Seal Guided Walking Tours before the book up. Whales, dolphins, seals, as well as other marine mammals can be seen anywhere along the coast. I just returned from a trip to Carmel/Monterey/Big Sur and saw tons of blow holes spouting close to shore, dolphins catching waves on Carmel Beach and even a baby sea otter nursing. It’s an awesome marine safari! Salmon spawn along the creeks around Marin while herring spawn in the bay. Head to the Richardson Bay Audubon in Tiburon and look for the flocks of gulls and pelicans hovering and then crashing into the bay to feed as millions of herring eggs wash ashore. Newts emerge across paths at Lake Lagunitas and other Marin reservoirs. Monarch Butterflies are clustered in the tree groves at Monarch Grove Butterfly Sanctuary, Pacific Grove and Natural Bridges, Santa Cruz. Ladybugs hibernate by the millions at Redwood Regional Park in the East Bay. Tule Elk herds thrive at The Tomales Point Park in Point Reyes. Just a few tips before venturing out. They say “There is no such thing as bad weather, only the wrong clothes.” If it does rain, do not let the weather stop you; dress appropriately. Avoid disturbing wildlife by keeping a safe distance and using binoculars or camera lens. Make sure to pick a hike suited to your child’s skill and endurance level. Don't forget snacks, water, sunscreen and anything else you need on a hike. Have fun observing the abundant wildlife, plants, geology and cultural richness that make where we live unique in the world. Rain or shine, they are there waiting to meet you.